The 1954 Chevrolet Corvette Nomad was a concept car built by General Motors and introduced at the 1954 General Motors Motorama in New York City. 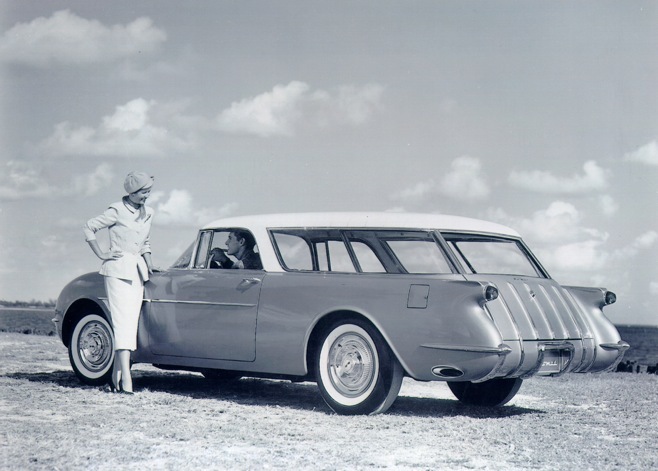 The Nomad was decidedly a sporty wagon way ahead of its time. The experimental Corvette Nomad made its debut along with the 1954 Corvette Hardtop and 1954 Corvette Corvair. 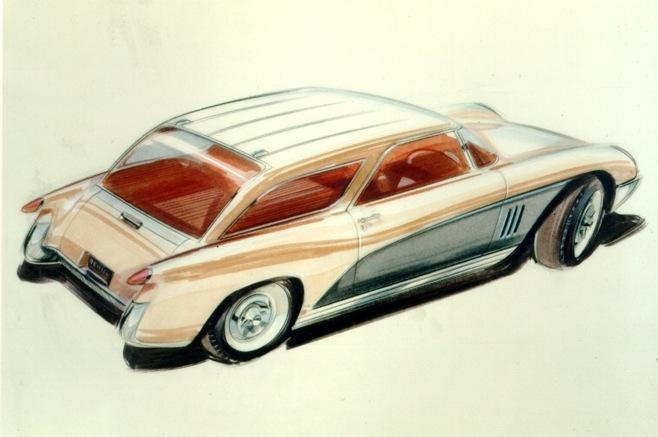 Just like the Corvette Hardtop and Corvair, the Corvette Nomad concept vehicle looked like the 1953 Corvette that was a experimental show car at the 1953 Motorama. General Motors produced 5 of the 1954 Chevy Nomads for the auto show circuit, only 3 are known to exist. 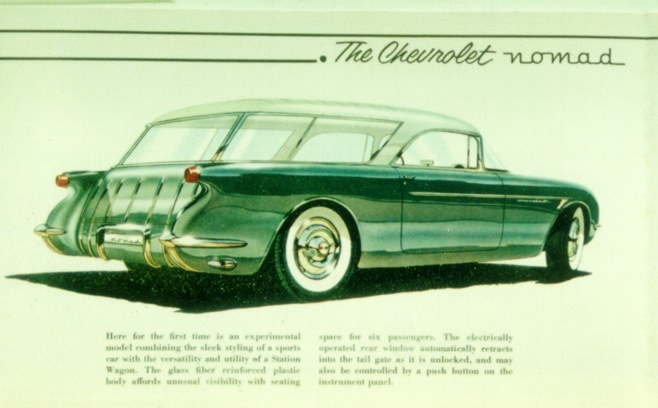 The Chevrolet Design Studio would created a forward thinking and forward looking design for the 1954 Nomad, including round headlamps mounted on gently curving fenders, a trademark Corvette grille and a forward sloping B-pillar. Some have referred to the 1953 and 1954 Motorama as the birth place of the American Sports car. The 1954 Chevrolet Nomad Sport Station Wagon made a great impact on the attending public at the 1954 Motorama. So much so that Harley Earl ordered the Chevrolet Design Studio to apply the name and looks to a 1955 Chevrolet Station Wagon. The name Nomad would become classic over the next 50 years as thousands would be restored by old car buffs that grew up in the 1950s and 1960s. The two-door Nomad differed from other station wagons of the era by having unique styling more reminiscent of a hardtop than of a standard station wagon. Chevrolet shared this body with its sister Pontiac, which marketed their version as the Pontiac Safari. While considered to be a milestone vehicle design, General Motors discontinued the original Nomad at the end of the 1957 model year due to low sales and the introduction of a new body for 1958. For the 1958 model year, Chevrolet moved the Nomad name to its top-line four-door station wagon. Chevrolet continued to use the Nomad name until the end of the 1961 model year, when all Chevrolet station wagons adopted the names of the regular sedan models. The Nomad returned again in 1964 and 1965 as a two-door mid-sized Chevelle 300 station wagon, and between 1968 and 1972 on the base station wagon model in the series. In the late 1970s and early 1980s, the name returned again on a trim package for the full size Chevrolet Van.